Sletten Shopping Center was designed by Arne Halvorsen and was opened on the 11th March 1964 on a plot where cows and sheep previously had their pasture. The proposal consisted of ninteen shops spread over 3 400 m² in a mall. The center was the first of its kind in Norway. In 2006, the center was rebuilt and expanded. The open plan is now unrecognizable. Today the centre contains twenty-eight shops, as well as a physician, a dentist, a chiropractor and acupuncturist. Today Slettebakken can be described as a functional zone where the program works well in relation to its function, but where a larger context emerges as “islands” without a good relationship with each other. The synergy between the commercial center, sports, school, church and residential areas are small. 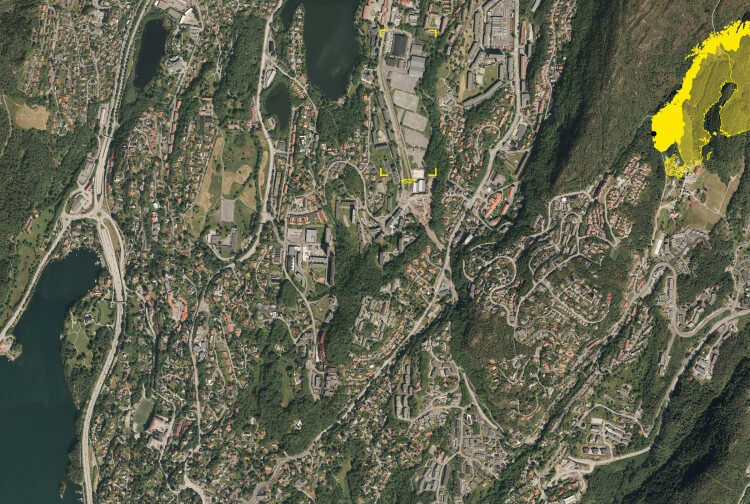 This has to do -among others reasons- with the three shared topographical levels in the area, a long stretch function in north / south direction and a small density in buildings. Slettebakken has with its rail and bus service a very good collective coverage. But because of the small urban density around this main artery Vilhelm Bjerknes road emerges as a barrier in the area. • Strengthening current activity zone with several programs, increasing the synergy in the area and creating less distances and more activity. The key to this may be to place the new school in the center of this zone and create a regional sports center between the school and FYSAK. • To provide a larger urban context and densification around Sletten center that converts blind roads to neighbourhood’s streets linked to the urban grid. • Strengthening cross-linkages between the three landscape levels is essential to create a functioning downtown district.